When my wife was pregnant with our first child, I asked my brother-in-law what he thought of parenthood. He compared it to torture. He was joking, but I have to say, the lack of sleep does give some validity to the parenting=torture department. The day in, day out of not getting enough sleep takes a toll. A recent study says that new parents miss out on six months of sleep in the first two years! With baby number two on the way, I was hoping to catch up on my sleep debt, and be refreshed and rested. But since Nate has transitioned out of his crib, he has been getting up between 3:30 and 5:30 AM. 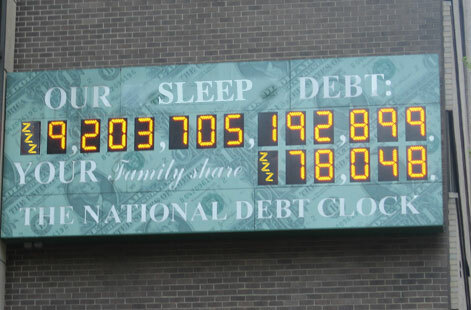 The sleep debt is piling up! By my numbers, I need to make up about 1,800 hours in lost sleep. So if I go to bed nice an early tonight and sleep through to right before the baby is born in the first week of October, I should be all caught up. I better pick up some Sominex. I rolled the dice twice on Brooklyn eats this weekend, and threw 2 sevens. On Saturday we went to Jabcob Riis Beach, beautiful weather, warm water. Then before the beach got too crowded, we went to Randazzo’s Clam Bar in Sheepshead Bay for lunch. Nate loved the waves, the cherry stone clams on the half-shell…not so much. And then on Sunday we hit the Red Hook ball field vendors. Nate slept through lunch, which was good, because I would not have wanted to share my pork and cheese pupusas and shockingly pink curtido. I don’t know what makes it pink, but mmmmm boy, good stuff. Raw clams, fried stuffed tortillas, and pink fermented cabbage, and not a single Tums all weekend. My son has recently, and incessantly, begun asking me, “Daddy, are you happy?” I think he us just trying to gauge my mood at that moment, but he asks so often, I’m starting to think he is psychoanalyzing me. With that in mind, I read a surprisingly interesting article in New York Magazine. 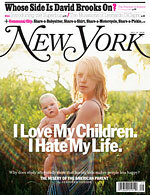 With the cover proclaiming “I Love My Children, I Hate My Life” I was expecting another screed about entitled parents and their over pampered children. Instead, the article “All Joy and No Fun – Why parents hate parenting” is an interesting essay on why having children doesn’t necessarily make you happier. Personally, I have always thought that children won’t make you happier, at least on a day to day basis. But I never viewed having children in terms of happiness, its about doing something selfless, devoting yourself to something other than yourself. I think this used to be more common, peoples lives weren’t just about themselves and their own self satisfaction, it was as much about family, church and community. And this doesn’t necessarily make you happier, but it might give your life more meaning and a greater sense of purpose.